Wow, what an original name. 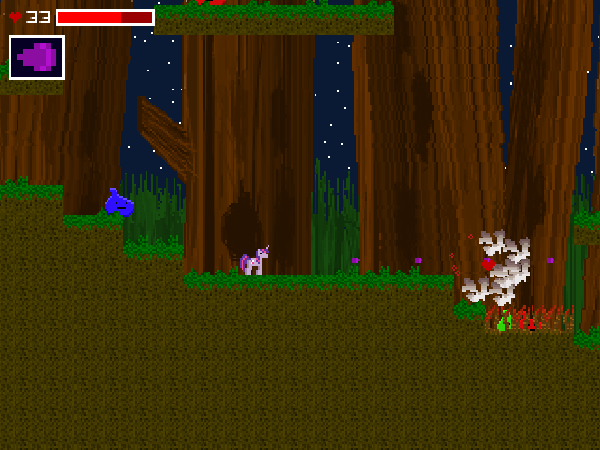 Anyway, help Twilight go through the Everfree Forest killing monsters and stuff in this action sidescroller that I made in my free time. EDIT: Change the map a bit. It was made using LÖVE. Credits to inosine for making the 2° boss sprites. Aside from birds flying through dirt like dig-dug, and Gilda the size of Crackle, I liked it. Felt a little easy, maybe add a harder difficulty. I was annihilating everything up till the third spell, then I just went passed every enemy to the final boss, and still had enough HP to win. I espicially liked the moving background. (02-07-2014, 07:53 AM)Dark_X Wrote: Aside from birds flying through dirt like dig-dug, and Gilda the size of Crackle, I liked it. Felt a little easy, maybe add a harder difficulty. I was annihilating everything up till the third spell, then I just went passed every enemy to the final boss, and still had enough HP to win. I espicially liked the moving background. Huh, I asked some friends to play it, and they said it was too difficult, maybe I change it too much. I will try to fix the other things, especially Gilda's size which I don't know why I thought it was ok.
For one, the jumping feels very floaty. I think you keep applying force for too long of a time, and the gravity is too low. A better idea is to apply force for a shorter amount of time, but increasing the force itself, and simply increasing the gravity. Really, this one should be simple; removing the wings shouldn't detract anything from the narrative. And then of course there's the polish stuff: Game could use having some sound, you should be able to keep firing by holding the button down, you shouldn't be able to keep jumping by holding the button down, and some other stuff. Either way, good job so far, and I'll be looking forward to updates. As for the floaty jumping, It's really the same as Cave Story(which is the base of my game). Also the alicorn Twilight isn't such a deal and she can't fly well in the show anyway, and it can be a reason for the "floaty" jumping. I have to admit that the game isn't polished at all, I have to work on that: add more enemies, more levels, music and maybe I can ask an artist friend to make better/new sprites and tiles. About the "keep firing by holding the button down", that's the third spell (same as the machinegun on Cave Story since I'm not good with original ideas(have to work on that too)). If a spell can be cast many times per second by pressing the button many times per second, then adding auto-fire is generally a good idea. So I'd say the first spell definitely would be better if you could simply keep the button pressed. For the second spell it's less of an issue, since it has a longer cooldown, but still there's no real reason not to have auto-fire on all spells. Have you considered adding diagonal shooting, when a player keeps both e.g. up and left pressed, or up and right? I also wished I could shoot downwards even when standing on the ground, since that would be useful with the second and third spells. Overall the first two bosses were too easy, third one wasn't hard but at least I lost maybe 20 hp during that fight. Other enemies seem ok, they can pose some threat if you are trying to move through them as quickly as possible, but with more caution it's not hard to avoid taking much damage. I hope new levels and enemies will be harder. Some ranged monsters could definitely spice things up. Captain Obvious Wrote: And yes, the game definitely needs some sound. I saw this on Equestria Daily and thought it looked cool. The theme really draws me in and makes me curious about what the game contains. A little narrative/backstory/story updates through the game would be good, to increase the intrigue level. Perhaps some kind of mystery to solve or something. Also, the controls drove me bonkers. Twi slides so far on the ground and it's incredibly annoying. It makes it really hard to jump accurately on the platforms. Like someone else said, being able to shoot downwards would be really cool. I think someone mentioned shooting down with spell #2 while on the ground. Rocket jump, anyone? If you wanted to add mouse controls, you could do like Terraria does and have the mouse aim the spells. This would generally solve the issue of firing down and diagonally simultaneously, tho I'll admit doing angles for the weapons and stuff becomes more complex implementation wise. But it might be worth it, to give more freedom of controls. I died sometime after the first boss because I was low on health and slipped of a platform I so totally should have landed on and landed in a pool of blobs that instantly killed me. The controls frustrated me to the point I didn't feel like trying again. But if this gets updated I'm willing to give it a second shot. I really like the switching spell idea, and having multiple spells. It adds to the intrigue and curiosity level. "I wonder what the next spell is going to be?" is a thought that keeps me wanting to play the game. The first level had an interesting design that I thought was pretty good. I liked that your initially instinct to go right only led to an impasssable wall that you could later blast through. That was super fun.